Werner Herzog’s My Son My Son What Have Ye Done, although not quite congruent with what you’d call my cup of tea, is an impressively bizarre little foray into… well, something. 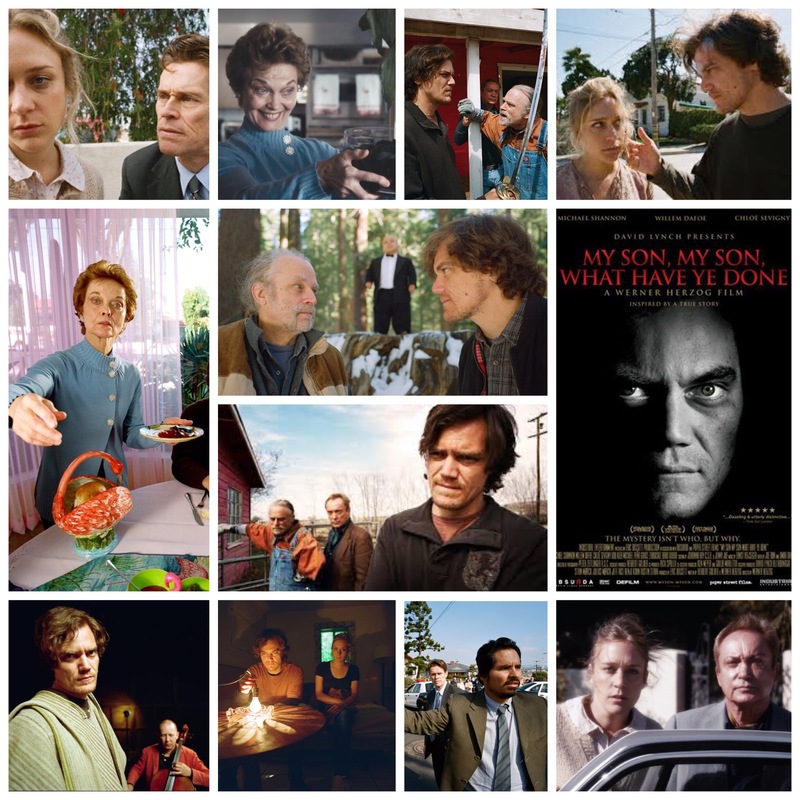 Michael Shannon plays a disturbed stage actor who, in an offscreen fit of violence, slays his mother (the great Grace Zabriskie) with a sword. Now, whether by mental illness, strange Peruvian spirits that piggy-backed on his psyche after a trip down there or reasons unknown, he slowly unravels throughout the rather short yet obstinately molasses paced film, until the final act solidifies his exodus into the realm of total bonkers lunacy. Shannon is an expert at all things in the circle of mental unrest in his work, and even when playing innocuous supporting characters or stalwart leads, there’s always a glint of menace in the whites of his eyes. It’s an impenetrable character study though, giving us not much to go on other than obtuse clues and the weird, wacky troupe of people in his life, portrayed by an appropriately zany bunch of cult actors. He has an uncle (Brad Dourif, a Herzog regular) with an ostrich farm and some, shall we say, interesting views on life. His quiet girlfriend (Chloe Sevigny) looks on in unsettlement, and his mellowed out drama instructor (Udo Kier) tries to make heads or tails of everyone else’s strange behaviour. You know you’re in the twilight zone when Udo Kier is the most well adjusted character in your film, but such is the territory. As Shannon descends into whatever internal eye of the storm privy only to him, he takes his mother and her two friends hostage, and the obligatory salty detective (Willem Dafoe) and his rookie partner (Michael Pena) show up to add to the clutter. David Lynch has an executive producer credit on this, and although the extent of his involvement is hazy to me, simply having his moniker post-title in the credits adds a whole dimension of bizarro to go along with Herzog’s already apparent eccentricities. It’s well filmed, acted and looks terrific onscreen, and I’m all for ambiguous, round the bush storytelling as a rule, but this just wasn’t a dose that sat well with me or tuned into my frequency as a viewer. Worth it in spades for that cast though, and their individual, episodic shenanigans.